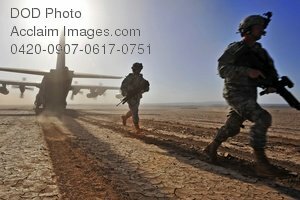 Description: Free, public domain image: Army Soldiers Setting Up a Perimeter Around an Air Force HC-130 Plane. 090423-N-0506A-583 Djibouti (April 23, 2009) U.S. Army Soldiers from the 2-18th Field Artillery Regiment run to set-up a perimeter around a U.S. Air Force HC-130 , during a training exercise in Djibouti, April 23, 2009. The exercise consisted of transporting Pararescuemen to their water jump, aerial refueling of a CH-53E helicopter, a assault landing on an unimproved runway, and transloading a simulated survivor from the CH-53E. (U.S. Navy photo by Jesse B. Awalt.